In honor of Pancake Day/Fat Tuesday/Lent, James and I made crepes last weekend. They ended up being crepes as my new crepe tools (spreader, spatula, and ladle) arrived and I was itching to try them out. The recipe was loosely based on Buttermilk Pancakes from the Double Energy Diet by Judi and Shari Zucker, the Double Enegery Twins. These ladies introduced me to agave nectar, rice syrup, and some other healthy stuff that I had never heard of. The book was a gift and is used regularly in my kitchen. The original recipe is below. We omitted the flaxseed meal (didn't have any handy), used 1% milk (what we drink at home), used plain whole meal/wheat flour, and substiuted course bran for oat flour (again because that is what was in our cupboard). 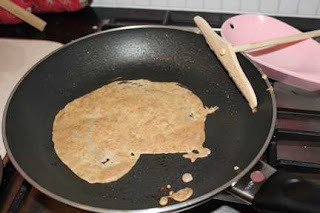 To make the mixture thinner for crepes, the ratio of dry to wet is about 1:1. Once we poured the mixture on the skiddle, we make it very thin with the spreader to transform it into a crepe. Cooking is supposed to be fun, so experiment! 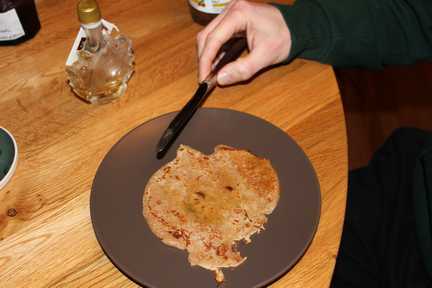 The first pancake of the batch never turns out as good as the rest anyways. 1. Place water in a marge bowl, stir in flaxseed meal and let sit for 5 minutes. 2. Add buttermilk, sweetner, oil, and vanilla to flaxseed mixture and stir until combined. 3. In a seperate bowl, whisk together whole-meal flour, oat flour, and baking powder. Then stir in to wet mixture. 4. Heat a large skillet or griddle until moderately hot and oil lightly. 5. For each pancake, pour 2 heaping tablespoons of batter onto the hot pan. 6. Cook each pancake until bubbles appear on the top, then flip and cook until other side if a golden color. We pulled out all of our jams from the fridge, pure maple syrup, Nutella, almond butter, and honey to create different dilicious crepes. My husband started off with the Canadian maple syrup, eh? Each was delicious, as well as the plain crepe on its own. If you have fresh fruit, such as berries or bananas, pile them on top too!